This is an experimental design with a flat front, curved bias seams (dramatically decorated with black silk satin bias), split hip panels, & a high back with straps. The back panels have ease in them for an aerialists muscles. So while it currently wrinkles a lot on the mannequin, I can’t wait to see how this actually works on my client. I am trying something new and sometimes new things fail, but it is very much worth my time & effort working on research and development. This sample will be fit without the binding so that final adjustments to the edging can be drawn on during the next fitting. 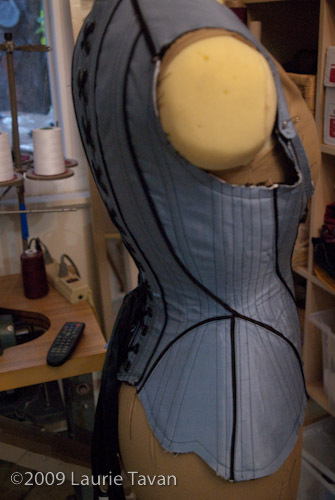 The mannequin it is currently displayed on does not fit the corset well but you can get the idea of the final look from these inprogress photos. I hope to tweak this design into something beautiful. Even with flaws I think it is looking pretty spiffy. 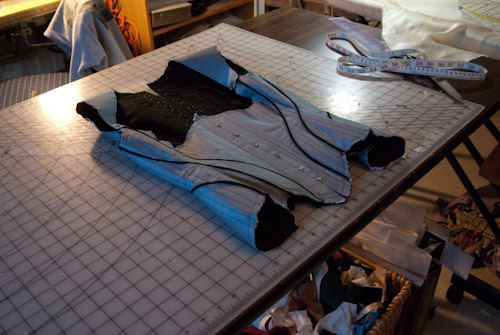 The fashion fabrics used in this piece are left over bits from other projects that I keep around for sample production. I of course hope it turns out lovely enough to be another example to add to my portfolio. While this corset is made in fashion fabrics it is *not* the final client corset but a test run of some of the techniques I’ll be using to construct the final corset for a client. 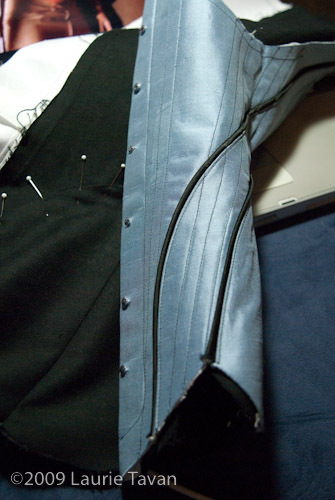 Sewing boning channels over piped seams was a new skill to figure out. I’m still in the process of coming up with a technique to do this smoothly and consistently. I’m picking up some industrial compensating feet for my Juki’s to see if they will make the transition over the lumpy surface easier. The feet are called *compensating* because the edge guide is spring loaded to deal with different thicknesses of fabric. In the past I’ve created shims to prop up one side of my foot when sewing along ridges but I’m sewing over the piping at an angle. It is possible the compensating feet will nothelp because I am not staying parallel to a thicker surface but sewing diagonal across it. I think the feet will still be a good addition to my tools regardless. 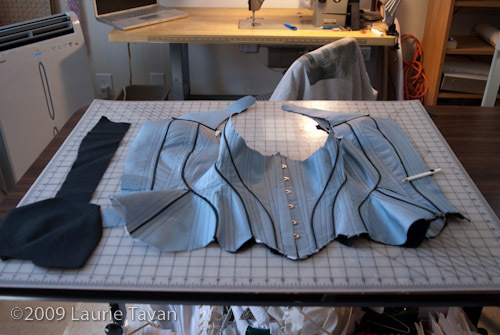 With the bias panels in this corset it is very important for the boning channels to run from top to bottom to support the fabric. 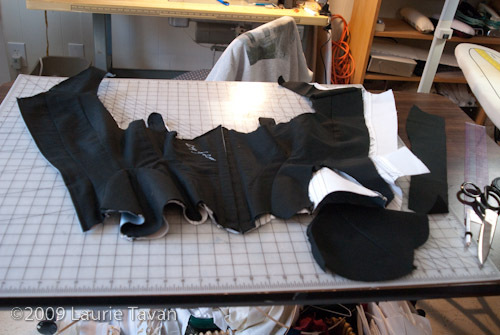 After a fitting on a real body I can start to work out where the support is needed most to minimize the wrinkling. 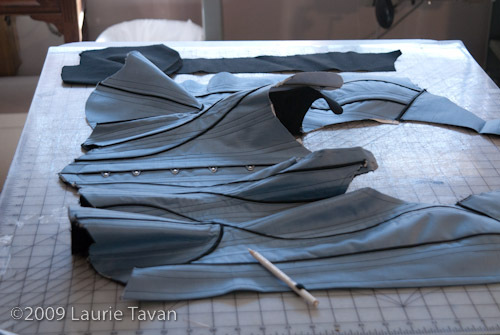 Running bones along the seam would remove the need to sew over the piping but would not create the final desired shaping and support for this design. So another small square of piping sample will be made up to test the feet when they arrive to see if I can get more precise boning channels sewn. Lovely corset! The contrast between the blue and black is wonderful. 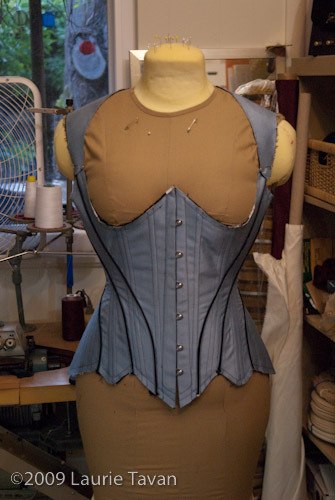 I love the straps that go over the shoulders, and the underbust that is peaked. This is one style I’ve been wanting to have custom made. I noticed in your info that we live not to far from each other. When I’ve saved enough pennies, I’ll contact you to arrange a fitting if you’re available. Oh, I’m also a client of Fern’s :) I may have met you at her office at some point. Thanks! My parrot Percy still goes to For the birds for boarding when I go on trips and of course for her annual check-ups! I’ve moved down a bit further south into San Jose but it is fairly easy to get to from anywhere in the bay. I’d love to work on something custom for you. I”m starting to take commissions for 2010 so feel free to contact me anytime. We can always start planning and discussing a project even if you are not ready to start. By the way, I am always willing to set up payment plans so you pay as you go which is usually better on most people’s budgets. The idea of a payment plan sounds good. 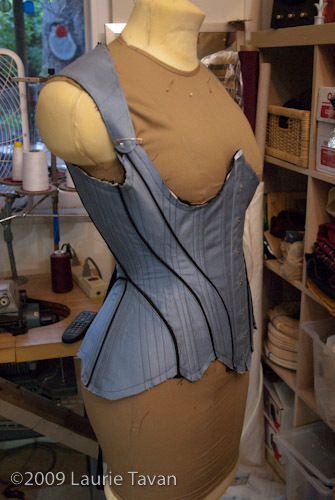 I’ll need to look at some of the pictures of corsets that I’ve saved to see what I want exactly. There are so many beautiful corsets, it’ll be difficult to narrow it down, lol. Funny you ask- I just bought some black, red, & white pvc to test out to make some samples. So no I haven’t sewn with them yet but they are on my list for research and development. I will need to make sure to hone my skills before trying a corset in them but they are not out of the realm of possibility. 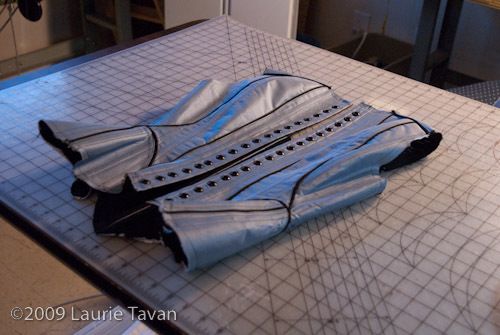 I have worked in leather but not pvc or patent leather yet. 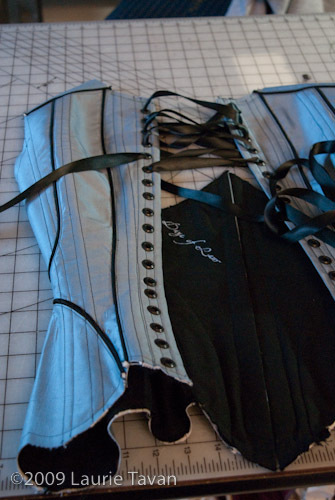 I love the design of this corset! It reminds me of an elegant bird. Beautiful! I love the way the piped lines flow. Have you tried increasing the foot pressure when sewing over the piping? Or maybe stop sewing just before the piping and pulling the threads for the inside and knotting them?